This user-friendly guide to acupressure is filled with easy to follow photographs, charts and illustrations. The acupressure meridian system, acupoints and treatment plans are explained in detail along with complete charts showing the location of the points. Acupresure is a safe, noninvasive and powerful way to participate in your horse's optimal health. This book inlcudes the basics of equine acupressure, plus 15 specific treatments for common equine physical and training conditions. Nancy Zidonis, Co-Founder of Tallgrass Animal Acupressure Institute Nancy Zidonis began her career in Equine Acupressure over 25 years ago. She is the co-founder of Tallgrass Animal Acupressure Institute and co-author of three animal acupressure texts, DVDs, and meridian charts. Nancy has studied Traditional Chinese Medicine, equine homeopathy, and essential oils. She is the Director of Programs for Tallgrass and teaches worldwide. Nancy is responsible for developing equine acupressure and Traditional Chinese Medicine online and hands-on training courses for the 330-hour Practitioner Certification training program. She is Adjunct Faculty in the Equine Health Care & Complementary Therapies Program at Hocking College and a Founding Board Member of the National Board of Certification for Animal Acupressure & Massage (NBCAAM). Amy Snow has combined her professional publications background and experience in the healing arts with her love of all animals in co-authoring this book. When growing up in New York City she longed for a time and place to devote her life to the care and welfare of gentle animals. Teaching acupressure allows her the opportunity to offer people and animals a meaningful way to care for each other. 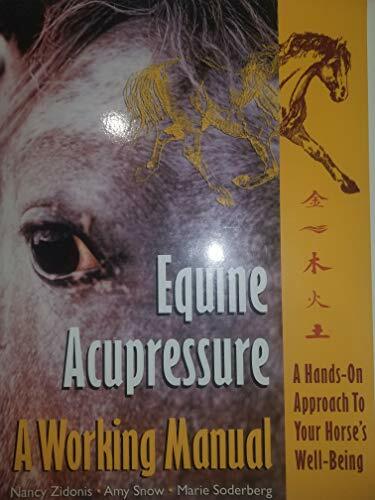 If you are looking for a working manual on equine acupressure, it has been published! The third edition of "Equine Acupressure, A Working Manual" is just that. A nicely presented, easy-to-reference book for those who want to try their fingers at acurpessure for horses. The background information on acurpessure is nicely translated for the equine-intrested. The meridian system is clearly defined and displayed. If you have ever wished for health care or medical treatment for you or your animals that is free, sage and simple to use, available night and day, and whereever you are, be assured that it exists, and it is right at your fingertips. It is called Acupressure. 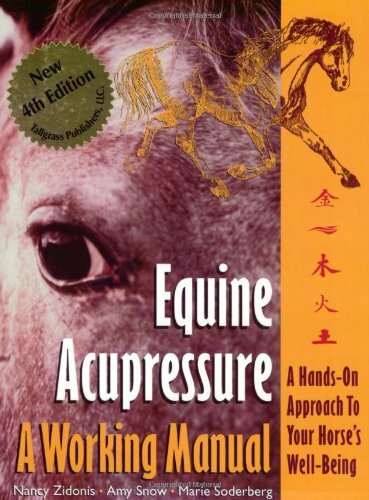 "Equine Acupressure, A Working Manual" provides a thorough overview of the origins of acupressure (TCM), explains its effectiveness and describes its benefits. The meridian system is picturedand described in detail, including each meridian's function, how it relates to the internal organs and other parts of the body, and the indicators for treatment. This book teaches the reader how to perform acupressure treatments, what to do before, during and after, and when not to perform acupressure. It stresses that attunement to the horese and allowing him to be the guide throughout the treatment is of utmost importance. This book teaches how to observe the horse and what to expect. Zidonis, Nancy A.; Snow, Amy; Soderberg, Marie K.